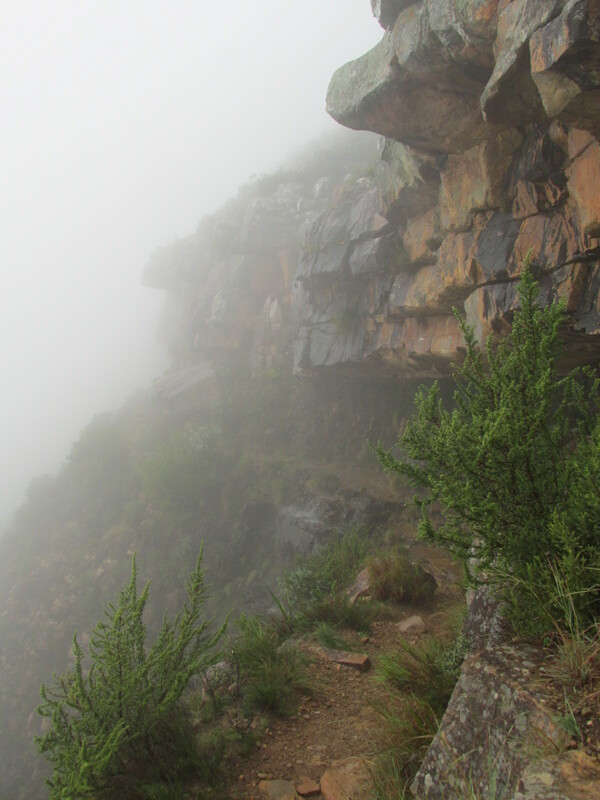 There is something very beautiful and mysterious about hiking in the mist. The landscape changes completely and a sense of magic seems to cover everything in sight. 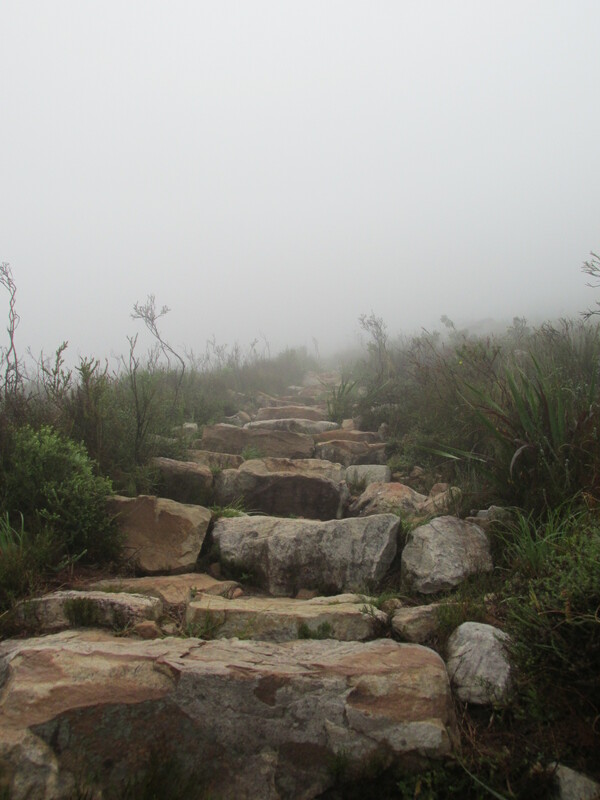 It is different hiking in the mist, and if you don’t know the path you are taking it is not advisable to do it as it can be incredibly disorientating and easy to get lost. But if you are comfortable you know where you are going, the mountain opens up its magic to you. It was a spur of the moment decision to go hiking. After a bit of a chat with my hiking partner, we weighed up the weather and the safety and with all that in mind we decided the conditions were still ok to head out. 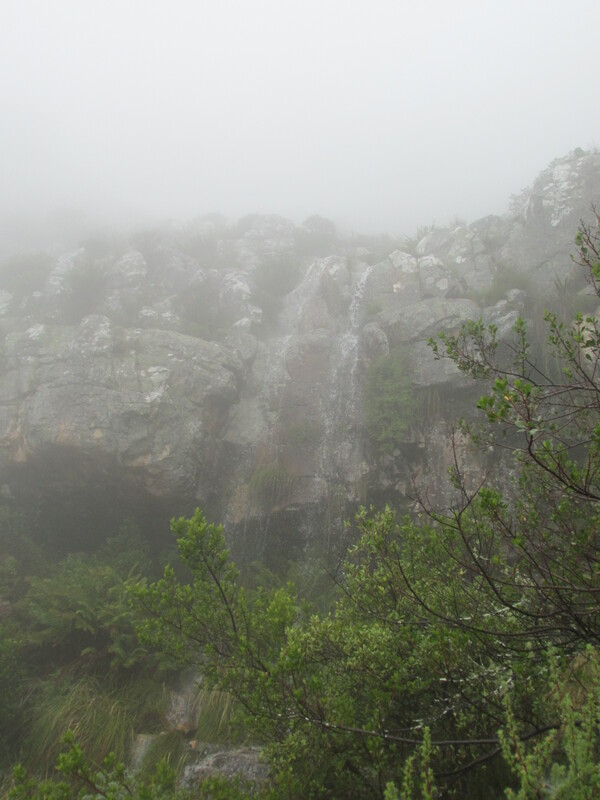 I love hiking in the mist and a little bit of wet doesn’t bother me at all. 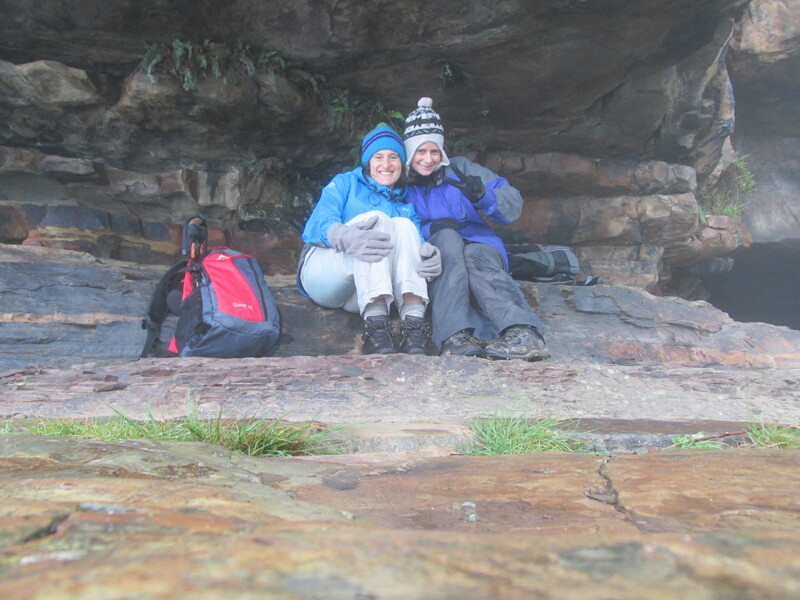 In fact, it all adds to the atmosphere and of course there is nothing better than having a hiking partner who is not afraid of the cold and damp! As it had been raining, the mountain was likely to be wet and slippery so we decided to take an easy meander across the mountain. The plan was to take the path up before the cable way station and head up to the contour path above where we would turn left and then walk all the way along the contour of the front face of Table Mountain and either return the same way or head down on Tafelberg road below and walk back along the road. Hardly anyone was on the mountain, Tafelberg empty of the cars that normally fill the roadway on both sides, who could blame them really, it was cold, windy and wet but for us it was another perfect training day to be out on the mountain even if this was going to be more of a flat hike than a climbing one, it was still time on our feet. This is where we started our hike but I took this photo on the way back as when we started you could see nothing behind the sign due to the thick mist. The stone pathway leading us straight up the mountain to the contour path. As we climbed up we could see the lower cable way station below us shrouded in the mist. At times, looking back, as the thick mist rolled in we couldn’t see it at all. The mist was thick and at times visibility was limited to a few meters around us. The soft mist sweeping past us, painting the mountain side in tiny dew drops. To get to the contour path we headed straight up a rather steep stone path. Luckily the steps were relatively small making the climb so much more enjoyable. As we reached the contour path, the lower cable way station below us was hidden by mist, as was the road now far below. It was just Judi and I, alone in the mist on the mountain. As always it was beautiful and peaceful. A beautiful protea getting ready to bloom. Not much of the mountain to see as the mist rolled over its edges. 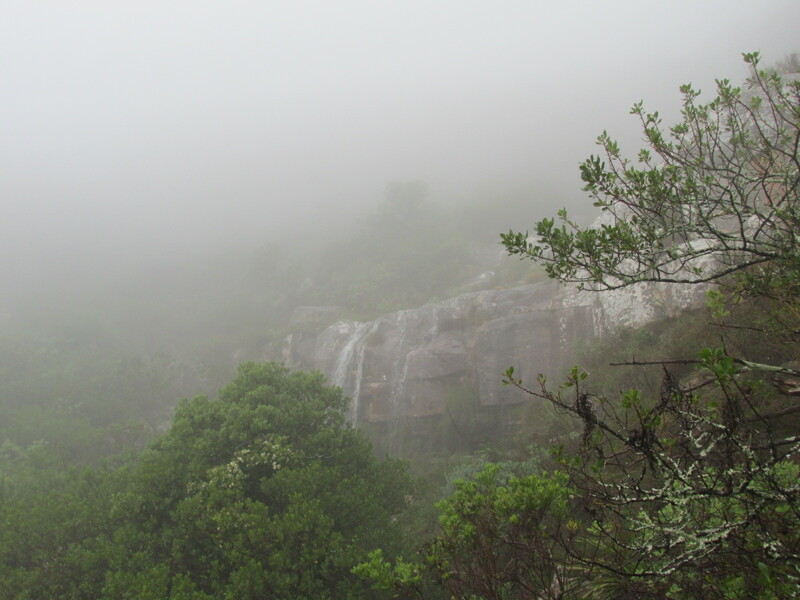 With the recent rains, although not much at all, we were so spoilt and got to see five magnificent waterfalls spewing water down the mountain side and with each crossing our hiking boots not finding many dry stones to step on. We may not have had views of the city below us, but the sights of the waterfalls were magnificent. 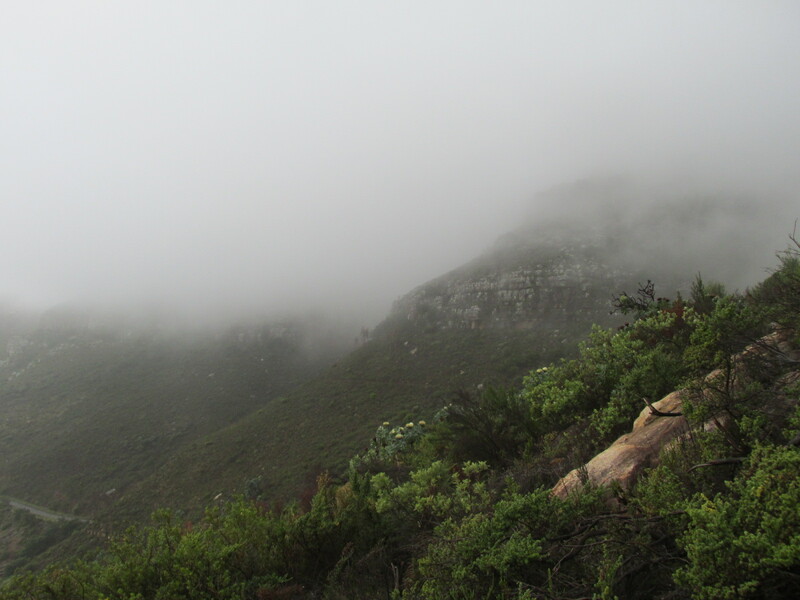 We crossed paths with a few fellow hikers also braving the mist, and chatted to a few. I love how the mountain is place where complete strangers greet each other and even stop to chat. 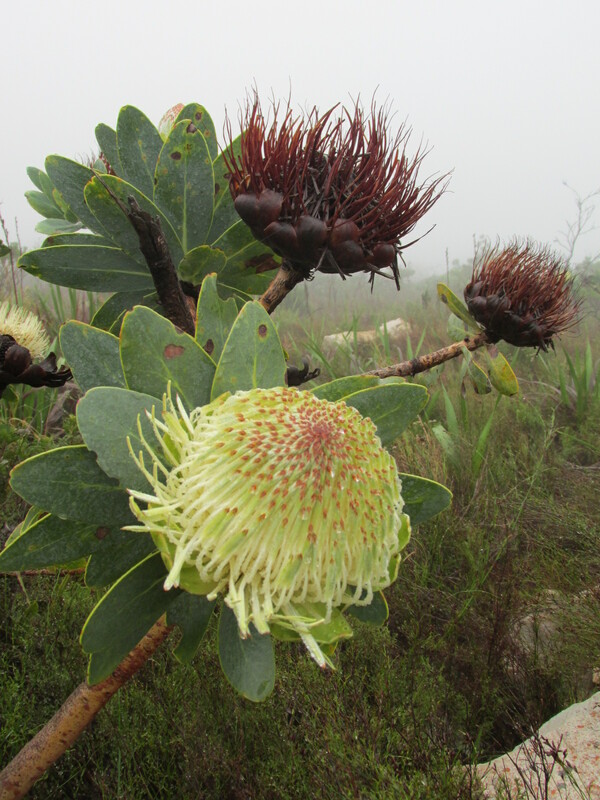 With the start of the winter rains, the mountain was alive! This is the first waterfall we came across. And another waterfall, this one we had to walk under. By the time we reached the fourth waterfall, a huge magnificent wall of water flowing fast from over the ridge up above, feeling peckish we decided to stop for some lunch. The waterfall was deafening but a rock overhang just next to the waterfall offered a perfect dry spot for us to stop for a bite to eat. 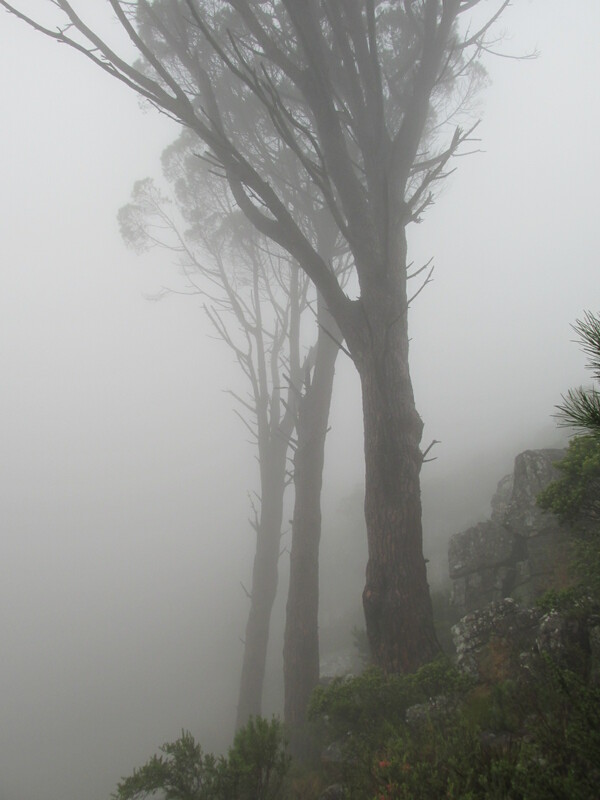 Beautiful, mystical mountain trees draped in mist as we walked. Another waterfall, this one so magnificent and loud in the thundering of water it was almost deafening. It was by this magnificent waterfall, we took shelter beneath a rock overhand and stopped for some lunch. This was taken with the self-timer on my camera. Soon we were back on the path still heading in the direction of Devil’s Peak. 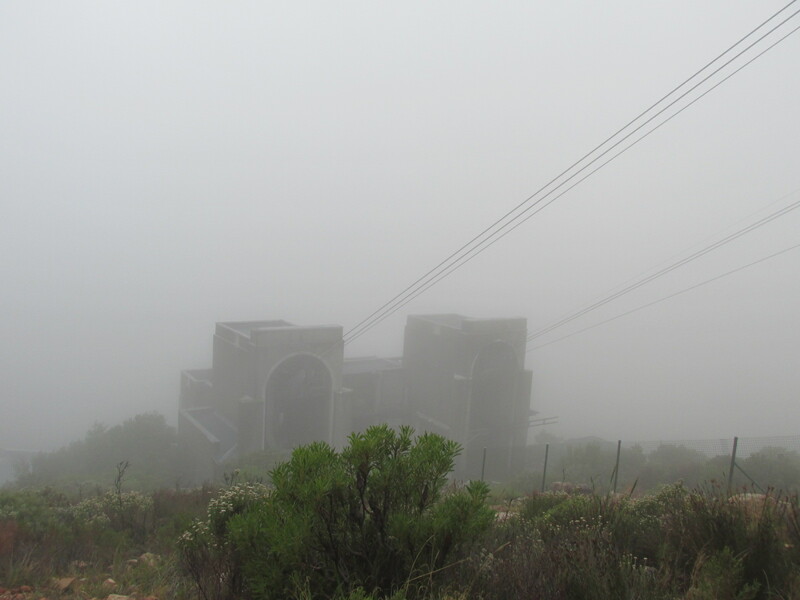 In the mist, without the usual landmarks on show, it is hard to know where exactly you are on the mountain as you can’t say how far you have come but we knew we were nearing the other end of the mountain. 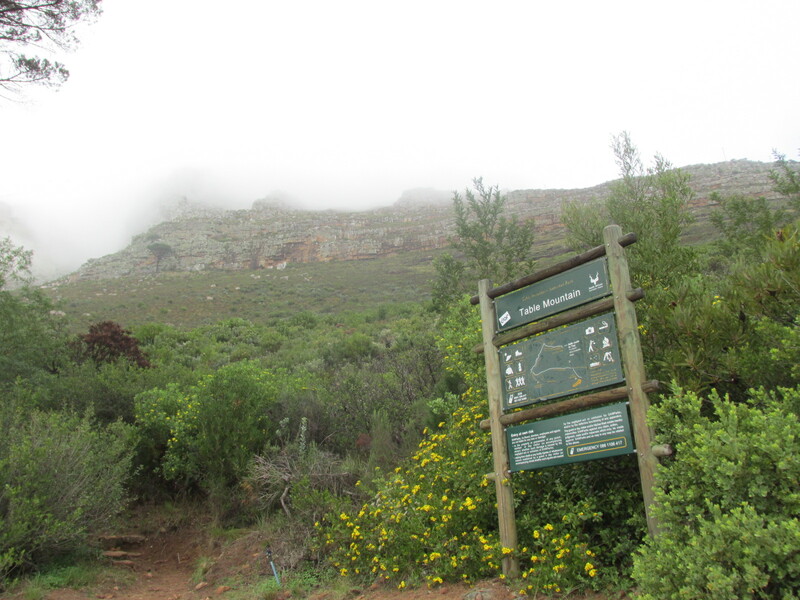 Soon we came to the path that would lead us back down to Tafelberg Road, we turned to the left along the path that would begin our descent down. 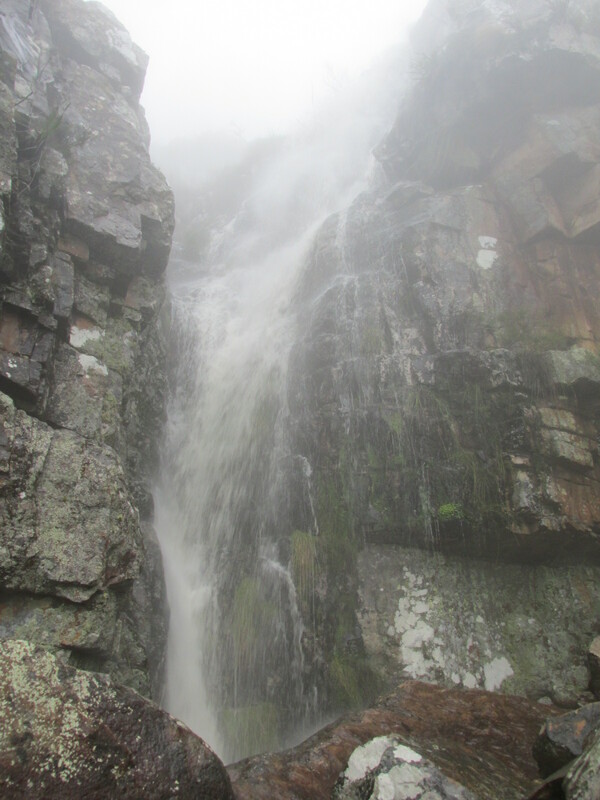 More waterfalls, we were certainly spoilt with so much beauty on the mountain today. As we were walking down, two trail runners came up behind us and we stepped aside to let them go past, as they did so they turned and said that the two of us look like we are about to attempt an assault of Everest. We laughed and said that’s what we training for. They smiled at us and continued on their way. Little do they know that every time we set out on the mountain we are in training for our next big mountain, our goal climbing the Seven Summits, including Everest. Each time Judi and I meet we talk about our next mountain and the discussions are well in motion. Some exciting news in this last week is that another of our Aconcagua team mates has confirmed they also want to climb the Seven Summits with us. Our team of 3 has now grown to 5 and I couldn’t think of more awesome people to climb these future mountains with. Soon we will be arranging a get together with Simon to start putting our plans into motion and setting dates for our next mountain adventure so that we can communicate it with the other two who are keen to join. Judi and I have also decided that from our next hike we will start carrying heavy packs again. 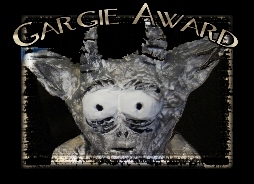 The thought of it makes my body groan! But we’ll start lighter, with around 10kg’s and build it up again until we have reached our goal weight to carry. As we headed back down the mist was finally beginning to lift and the mountain was starting to show her beautiful slopes again. As we headed back at a swift pace along Tafelberg Road we came across a huge, exceptionally long marquee tent filled with people dressed in suits and smart attire. We got some strange looks from people as we walked past, we certainly did look out-of-place amongst them. One woman, who was wearing ridiculously high high-heeled shoes walked past us on the road and turned and laughed as she asked us if we would like to swap shoes with her! A bit further on we stopped another who was walking past us and asked what was going on inside the tent. Apparently it’s called the ‘Table of Prayer and Unity.’ It is an event where a long table is filled with over 200 people of all religions, colours and creeds. They eat together and then they prayer together for the people of Cape Town. Apparently it happens simultaneously across the world in other cities and has been happening in Cape Town for the last five years. You learn something new every day! Finally back at the starting point and the car, the mist was just beginning to lift and the mountain was starting to show her slopes again. Although every part of my body wanted to sleep in this morning as I heard the wind outside and couldn’t find the sun peeking out of the clouds anywhere, I am grateful for a hiking partner who says yes to crazy ideas of getting up in the cold and heading out to the mountain, the place we both love. 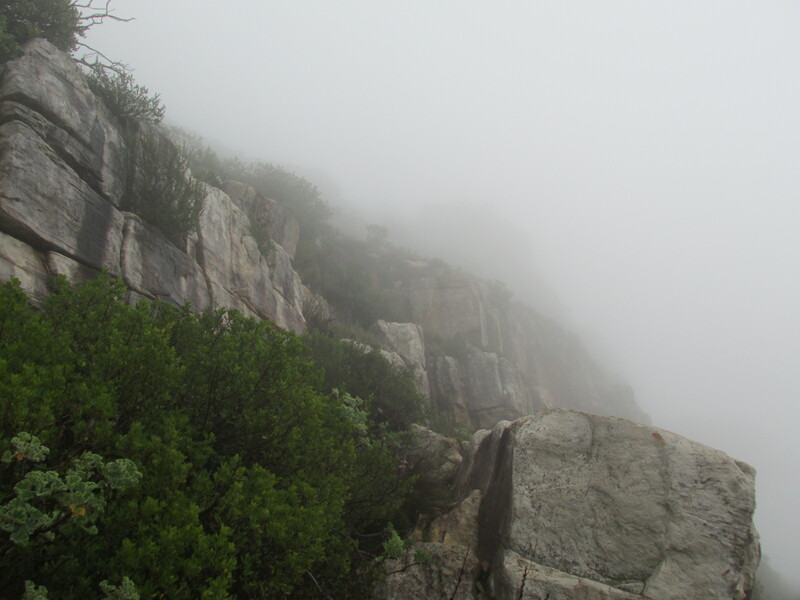 Today, there was absolutely nothing more beautiful than wandering around on the mist covered mountain slopes. My soul, once again, sings!